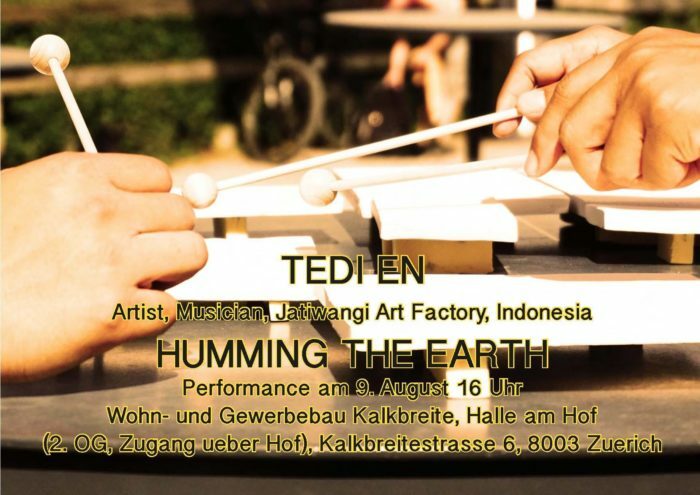 As part of Tedi En’s residency in Zurich, En conducted a two-part performance, Humming the Earth. He produced handmade ceramics as musical instruments. Tedi En is an artist musican from Jatiwangi Art Factory, Indonesia. Supported by the Kultur Stadt Zürich and Migros Kulturprozent in 2013, the City of Zurich Artist-in-Residence Programme for Young International Artists provided an artist studio and apartment at Pfingsweidstrasse, Zurich. Through studio-based residency in close proximity of the Toni-Areal Campus of ZHdK, supported by ZHdK’s facilities and network, this programme aims to help postgraduates from various disciplines across the arts (fine arts, media arts, photography, film/theatre, dance/performance) transition to professional practice. The programme has since supported 8 emerging visual artists from Asia to spend an up to six months period in Zürich, during when they engaged in artistic experimentation and research, conducted cross-disciplinary work and pursued work beyong their own discipline. They are Frank Tang, Shiyu Gao, Ivanhoe Lam, Chloe Cheuk, Trevor Yeung, Joao Vasco Paiva, Yik Chow and Tedi En.